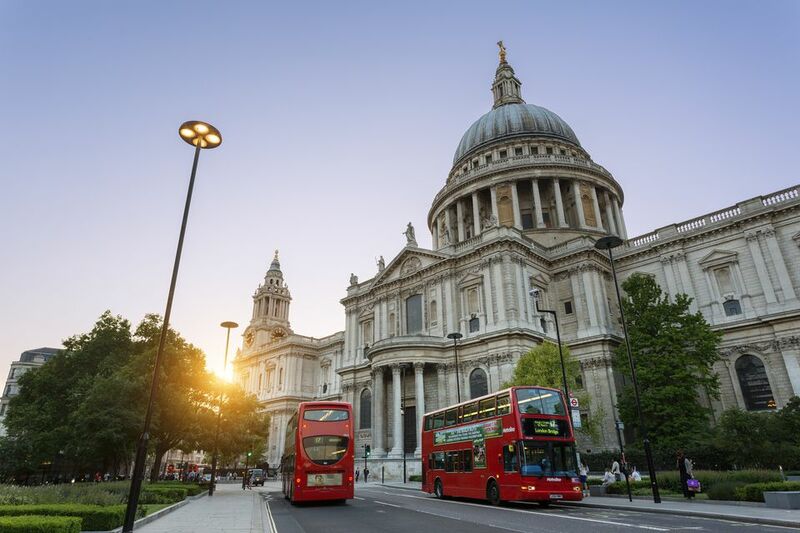 St. Paul's Cathedral, designed by Sir Christopher Wren is, along with the Houses of Parliament and London Bridge, one of London's greatest icons. The familiar dome is the centerpiece of some of the city's best views — from the top floor of the Tate Modern on Bankside or the romantic spot on the middle of Waterloo Bridge. And while St. Paul's has always been popular with Londoners, the picture of it surviving the Blitz, taken in 1940 by Herbert Mason from the roof of the Daily Mail, cemented its position as a symbol Britain's resistance to the Nazis. A cathedral dedicated to St. Paul has stood on Ludgate Hill in the City of London for 1,400 years. It was once believed to have been the site of a Roman temple dedicated to Diana but no evidence to support that was ever unearthed (so if you take a guided tour and the guide suggests that, be skeptical.) The first church was built around year 604 and before Wren's church rose on this site, four other churches occupied the spot. Fire and Viking raids destroyed one after another until the Norman's built an impressive cathedral in 1087 that stood, more or less, into the mid-16th century. A lot of the fabric of the church had already been plundered during the English Reformation under Henry VIII when, in 1561, lightning set fire to the steeple and parts of the church. For more than 100 years, various attempts to rebuild a cathedral never came through. The famous 17th-century architect and theater designer Inigo Jones drew up plans and works were even begun — but the English Civil War got in the way. In 1666, Sir Christopher Wren proposed rebuilding the church with a great dome. The plan was approved and just a week later, the Great Fire of London, begun in a baker's shop on Pudding Lane, destroyed most of the city. The scaffolding around St. Paul's probably helped spread the fire. Wren, at last, had his chance to build his masterpiece. It took him nine years to plan and 35 years to complete it, but he lived to see his son and the son of his master mason lay the final stone in 1711. When the St. Paul's was completed, during the reign of Queen Anne, it was the first English cathedral to be built after the English Reformation. There is a lot to see inside St. Paul's, from glittering mosaics (added to please Queen Victoria, who thought the place was dark and dull) and 400 years worth of sculpture and religious artwork. Admiral Horatio Nelson, the Duke of Wellington, and Christopher Wren himself are buried in the crypt. The cathedral's historic library was restored and refreshed to enable more exhibitions of its treasures. One of them, the Tyndale Bible, is one of three existing copies of the first holy book every printed in English. Tyndale was executed for producing it. Guided and self-guided tours can bring all this history to life and fill your dinner conversation with fascinating tidbits forever. And luckily, not all the tours cost money (on top of the price of admission) and those that do are pretty reasonable. Multimedia tours with high-resolution touch screens and "fly-throughs" of the dome and galleries are free with your admission ticket. They also include zoomable close-ups of ceiling artwork and paintings and archive film footage of the cathedral's history. They are available in nine languages—English, French, German, Italian, Spanish, Portuguese, Mandarin, Japanese, and Korean — as well as British sign language. Audio description guides encourage visitors to touch carvings and sculptures. These free guides feature music from the cathedral choir and interviews with cathedral experts. Introductory talks about the architecture and history are given throughout the day. These free talks last from 15 to 20 minutes. Ask about the next one at the guiding desk when you arrive. Free 90-minute guided tours include the cathedral floor, the crypt, the Geometric Staircase (also known as the Dean's Staircase highlight the marvel of mathematics and Wren's engineering skills), the Chapel of St. Michael and St. George, and the Quire. These are areas not normally open to visitors. The tours are conducted Monday through Saturday in the morning until early afternoon. Though free, you will need to book a place on this tour at the guiding desk when you arrive. Triforium Tours occur in an arched level above the nave and is not normally open to the public. You have to pay for this tour, which includes the Library, Christopher Wren's Great Model, the Geometric Staircase, and a view down the nave from above the Great West Doors. This tour must be booked at least two days in advance and is offered on specific dates published on the Cathedral website. Groups of five or more should book at least five days in advance. Keep in mind that there are 141 steps to the Triforium level and no lift, or elevator. Touch Tours are two-hour tours of the floor and crypt of the cathedral that are offered on selected dates for the visually impaired. These are free but must be booked in advance. At 365 feet high, the dome of St. Paul's Cathedral is one of the world's largest cathedral domes. It weighs a hefty 65,000 tons, with 850 tons alone for the lantern at the top. The cathedral is built in the shape of a cross, and the dome crowns the intersection of its arms. Inside the dome, you'll find three galleries which offer great views of London as well as the floor of the Cathedral. Before you start the climb, be sure you can actually make it. The staircases are one way up and another down and quickly become too narrow for passing—so once you start climbing you cannot change your mind. Whispering Gallery. Reach this gallery by climbing 259 steps. Go to the Whispering Gallery with a friend, stand on opposite sides, and face the wall. If you whisper facing the wall, the sound of your voice will travel around the curved edge and reach your friend. From here, you can look down at the floor of the cathedral. Stone Gallery. From here there are great views as it's an outside area around the dome. You can take photos from here. It is 378 steps to the Stone Gallery. Golden Gallery. This is the third gallery and is 28 steps from the cathedral floor. It is also the smallest gallery and encircles the highest point of the outer dome. The views from here are spectacular and take in many London landmarks including the River Thames, Tate Modern, and the Globe Theater. When: The Cathedral is open to visitors every day, however on Sunday, the cathedral is open for worship only, and there is no sightseeing. Services: Worship and prayer services are held every day, including sung Matins and Choral Evensong. Everyone is welcome and entry for services is free. Where: St. Paul's Churchyard, London EC4, nearest London Underground stations: St. Paul's, Mansion House and Blackfriars. Visit St. Dunstan's Chapel. Head up the cathedral's main steps, and enter on the left-hand side. Inside you'll find the line to buy tickets, but keep to the left and you can enter St. Dunstan's Chapel for free at any time. This is open for prayers all day but is well-frequented by visitors, too. The chapel was consecrated in 1699 and is named for St. Dunstan, who is a Bishop of London who became Archbishop of Canterbury in 959. Visit the Crypt. The Churchill screen/gates divide the refectory, and the crypt so can be seen for free when visiting the cafe/shop/restrooms. The crypt is the largest of its kind in Europe and is the final resting place of a number of prolific Brits including Admiral Horatio Nelson, the Duke of Wellington, and Sir Christopher Wren himself. Attend a Service. St. Paul's is a place of worship first and a tourist attraction after that. There are services every day in the cathedral and all are welcome to attend. Attend a Christmas Carol Service. St. Paul's Advent and Christmas events schedule is published in October, and the free highlights usually include Benjamin Britten's "A Ceremony of Carols," featuring the cathedral boys choir, Christmas Carol Services on December 23 and 24, and a ​Celebration of Christmas that features the Cathedral Choir, City of London Sinfonia, and celebrity readers.